Here is how Apple’s iPad’s thickness varied in the last 5 generations. 9.7mm, 8.8mm, 9.4mm, 9.4mm and BAM! 7.5mm. The last one is the iPad Air, and its thickness (or should i say, thinness) makes a huge difference to the overall feel of the tablet. Coming from an iPad 3, it’s hard to imagine both tablets having the same screen size. The iPad Air has a 43% thinner bezel, which makes it much more manageable. Although, even if it is a major redesign of the not so thick and heavy iPad we are all familiar with, it still carries the same sharp display, and even better hardware. The iPad Air looks like an enlarged version of the iPad Mini. But I really love the design over the previous iPads. Apple cut down the bezels on the side but kept enough of it to make sure holding it with one hand is not an issue at all. 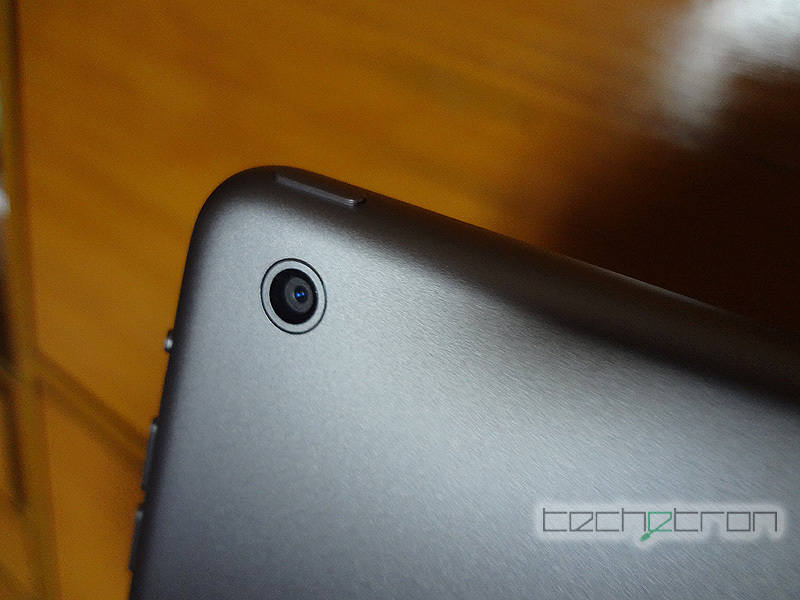 The edges of the iPad Air aren’t tapered like the last 3 generations, but rounded. I would like it squared off, but that is just a personal preference. 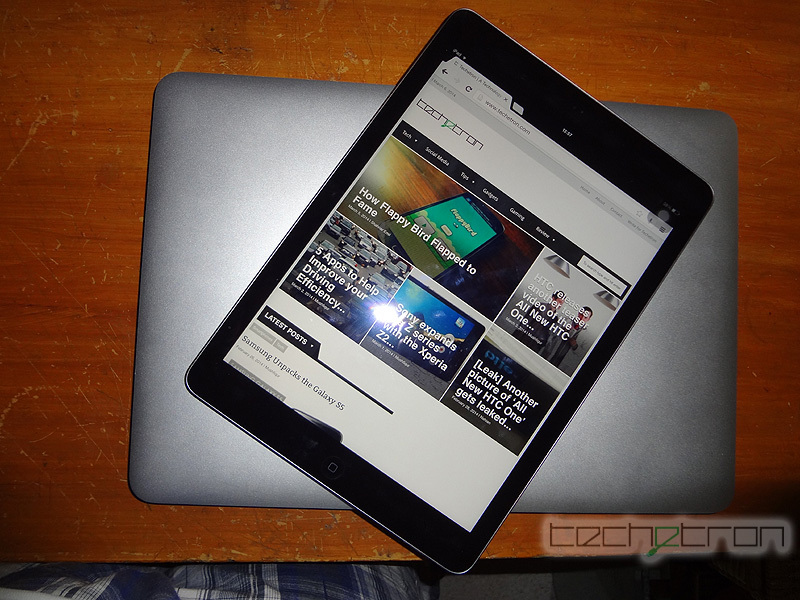 There is honestly no other device you can compare the feel of the iPad Air with. You might think that it would feel like the iPad Mini, but I find it to be a bit too heavy for its size. The Galaxy Note Pro 10.1 comes close too, but then that has a faux leather back. The iPad Air with its pencil thickness, and its aluminum back just feels… good. And it is so thin, it even feels great with a case on. The display is Apple’s 9.4 inch Retina Display. For us number-loving geeks, that translates to a 2048×1536 IPS display. Being IPS, viewing angles are great. Black levels are satisfactory, not as good as an AMOLED but better than any other 10-inch tablet in the market. However, I noticed that the iPad’s screen is slightly warmer than the screens of its MacBooks, and you really notice it when you look at the laptop for prolonged periods and then look back at the iPad. I’ve noticed this with all the previous iPads and it slightly bothers me that they haven’t fixed it. The Air runs Apple’s iOS 7. Its pretty much the same as iOS 7 on any other iOS 7 device. It’s fluid and full of tiny effects like the parallax effect, all of which make it a better experience. The touch is very responsive, sliding on the home screen, lagged once or twice in my use, but to be honest, I was pushing it pretty hard. As of September 2013, Apple announced that all of its devices would come with the iWork and iLife suites free, and the new iPad is definitely not an exception. Pages, Numbers and Keynote really aren’t awesome word processors, but they are free, and they get the work done while looking beautiful, so I can’t really complain. 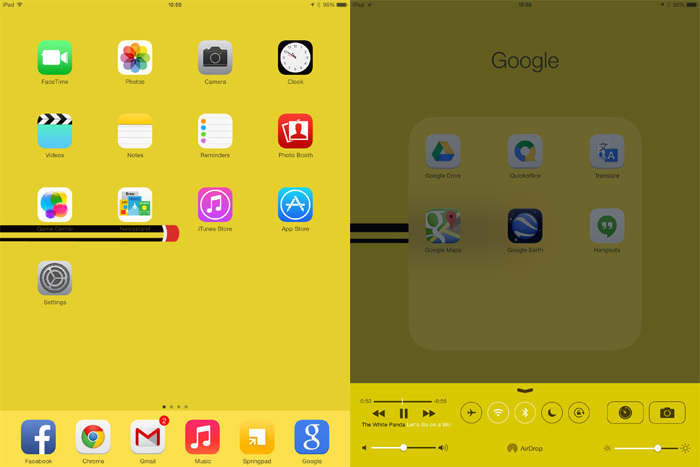 All the other apps, by Apple are well polished, and match the overall theme of iOS 7. The iOS App Store is still king with 1.1 millions apps and over 60 billion downloads. Google is catching up, and fast, but the App Store by iOS still boasts a far richer collection for its Retina iPads. Most of the apps on Play Store are either enlarged mobile phone versions, or ones for low resolution tablets. One complaint would be that a lot of the apps aren’t yet iOS 7 optimized. Then there is the keyboard. It’s not bad or anything, and I really like the split keyboard function. But I use an Android, and I really love SwiftKey, and I want to be able to use SwiftKey on my iPad. It’s not that I cant type without SwiftKey. It’s just that the iOS keyboard is just too annoying. It corrects words by itself, so if you want to type a sentence in social lingo, you really can’t do that fast, because it corrects every word you type. 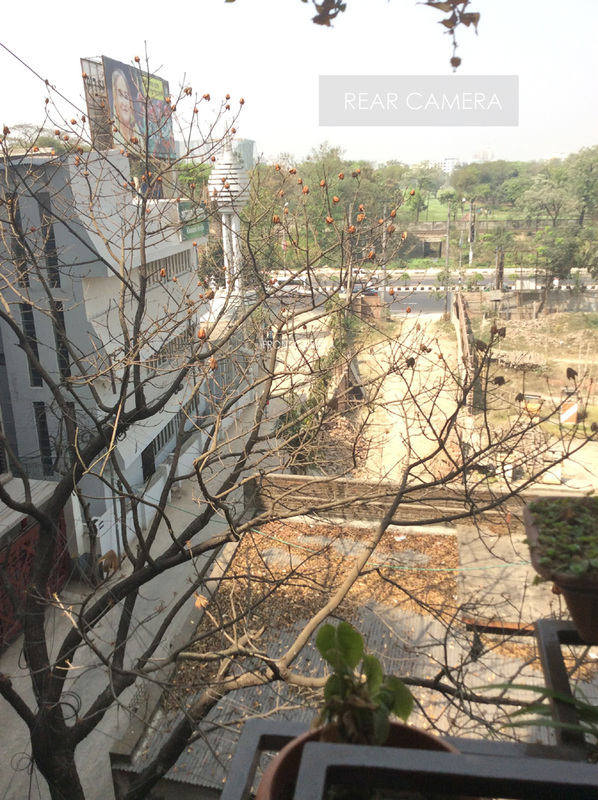 The 5 MP shooter on the iPad Air is the same as the one found on the previous iPad. It is definitely fast but the photos come out very grainy even in normal light. The front camera on the other hand is one of the best out there with exceptional low light capabilities. Regardless, taking photos on an iPad is pretty ridiculous making the whole concept of back cameras on tablets even more so. 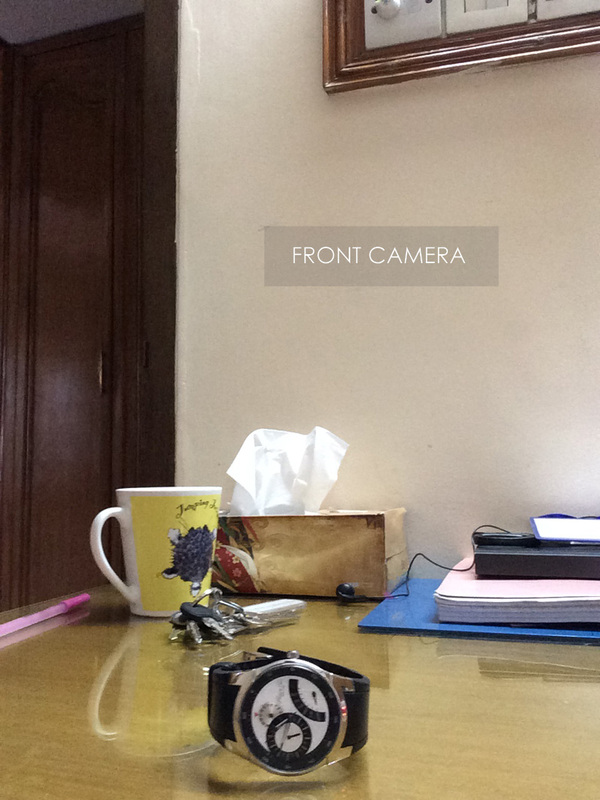 Moving on, the front camera is 1.2 MP. Not much to talk about it, other than the fact that it is grainy, pixelated, grainy and pixelated. The stereo speakers on the iPad are on the bottom of the iPad, one on each side of the Lightning port. The word stereo is pretty much useless as the speakers are beside each other, so you really listen to mono audio. Putting the stereo issue aside, the speakers are good. Loud, and holding the iPad in landscape doesn’t really distort or muffle the sound, unless you deliberately put your palm over the speakers. Gaming performance is blazing fast with the quad core GPU. The 4th Generation iPad was mindblowing, and this is better than that. Infinity Blade 2, Temple Run 2, pretty much every game I tested aced without lag. After using this for a couple of weeks, I finally figured out why Apple didnt name this the “iPad 5” or the “new iPad” but named it the iPad Air. The reason is, well when i hold the iPad, it feels effortless, as if I am holding… air. This reminds me of the Apple Keynote when Steve Jobs showed the world the iPad, saying how it would adapt to you instead of the used having to adapt to the device. With the iPad Air, that is what Apple achieved. Yes, it has flaws, and those flaws annoy me to bits. But so does every other device, such as the Galaxy Note Pro’s faux leather back that make me want to smash the device on the table. It crashes once in a while if you push it too far, the screen is a tad too warm, the speakers are both on the bottom, the camera is too grainy and the display bends too much. But I find that acceptable. It’s competitors? Well, there aren’t many. The Galaxy Note 10.1 Pro gets close, but not good enough to beat the iPad. 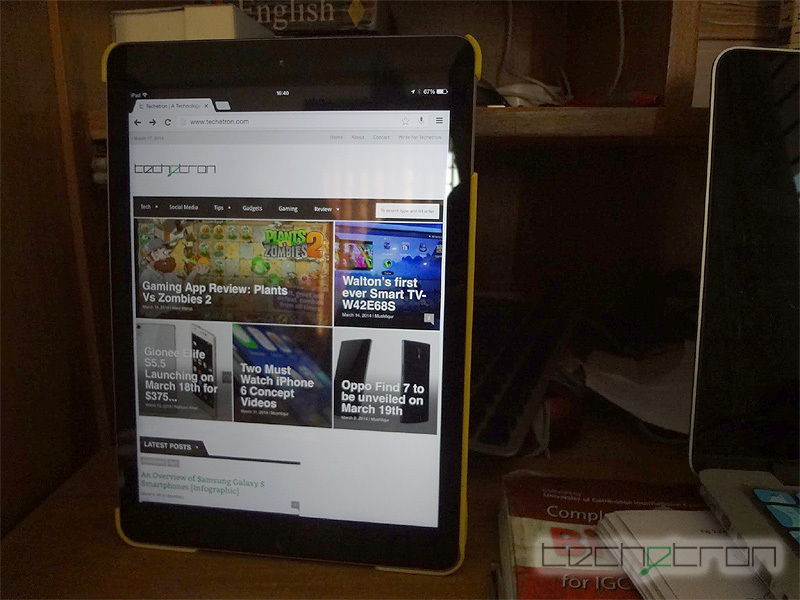 There are other tablets like the Nexus 10 which are far behind Apple’s tablet. 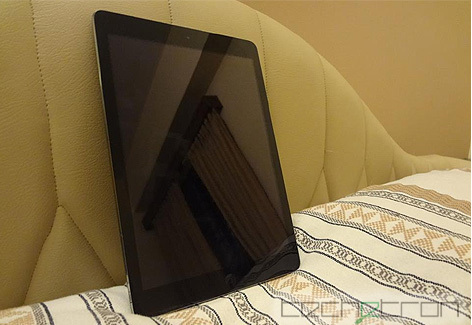 The new iPad Air is at the forefront of 10-inch tablets. For the past few years, since the first iPad, Apple has been setting the benchmark at what 10-inch tablets should be, and with the iPad Air it sets the benchmark even higher. This is certainly not the perfect tablet, because there will never be a perfect tablet. But this is as close to perfect as you can get right now. Excellent review, and I agree about the speakers, there is a reason why Bluetooth Speakers are becoming more popular, no tablet is going to be able to give really high quality sound for watching TV Shows, Movies and such. I also completely agree about SwiftKey, the slow iOS Keyboard really lags behind Android at this point and the flexibility with choosing different keyboard apps. Yeah totally. I mean i have to use my headphones everytime i want to watch a youtube video or something cause even in my own home, i cant hear everything properly. Honestly, NO mobile device these days give you good sound, other than the HTC One. Makes perfect sense. How on earth would you be able to fit high quality drivers into such compact devices. Other than iOS, really loving this device.